“We old timers were a long time in believing there was anything in the so-called spit ball. But results have forced us to admit its existence and its power to deceive. Now they are talking about the knuckle or finger nail ball. For a long time I supposed that was a joke. 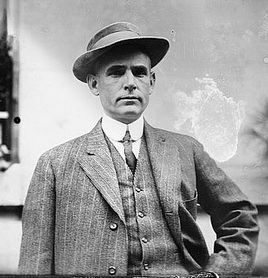 But just this morning I had a letter from Clark Griffith, telling about a discussion he had with (Cap) Anson during the schedule meeting at Chicago over the knuckle ball. Griff ought to know what he is talking about, and he convinced me of the knuckle ball’s effectiveness but his argument with Anse must have been funny. “You know Anse has to be shown on every proposition. Griffith told him that (Ed) Summers of the Detroit team had the best command of the knuckle ball and that it came up to the plate in such a peculiar manner that it fooled not only the batsmen, but the catchers too. “’That’s all rot,’ Anson said to Griffith, but Griff came back with the willingness to bet Anson $100 that Anse couldn’t catch three out of five knuckle balls as thrown by Summers. Anson jumped at the chance and took the wager, and it will be decided sometime this year, if Summers, Anson and Griffith happen to be in the same city at the same time. 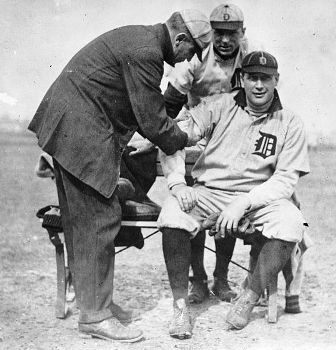 Al Summers has his arm worked on by Tiger trainer Harry Tuthill, first baseman Del Gainer looks on. There’s no record that the wager was ever decided.